When we are constantly being told to take more exercise, it’s easy to make excuses about not having time or about the gym being too expensive. There is one form of exercise, however, which takes little time and does not need to cost anything. Many health experts will tell you that walking is in fact a perfect form of exercise. Not only is it an easy way to get fit, but you can do it anywhere, any time, and there is no special equipment needed. The health benefits are many and varied. 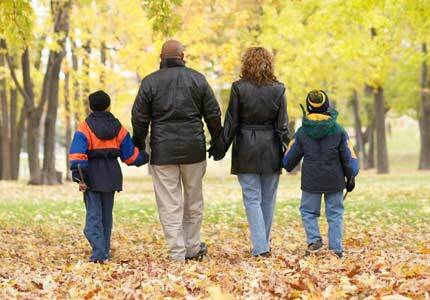 By walking you can build protection against heart disease and diabetes, high cholesterol and even some cancers. Walking will certainly help to maintain a healthy weight, boost your immune system, your energy levels and assist in managing stress. 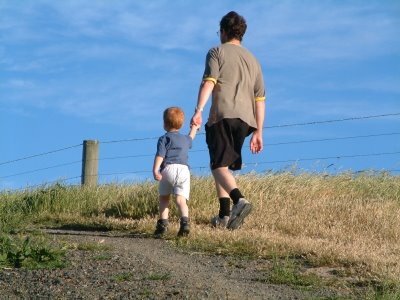 Develop the walking habit and you will soon realise that it has become part of your daily routine. Best of all is that you will notice the benefits quickly and be feeling so much better for it. Try to walk every day for a month, or at least five days per week. Research tells us that any new activity done consistently for four weeks will result in a firmly embedded new behaviour. My four-week plan will show you how to build walking into your everyday life so that time should not be an issue. Here I am going to add a plea to mums and dads everywhere. As a schoolteacher of over 30 year’s experience, I was always amazed at the number of children being driven to school over short distances every day. Here is a perfect opportunity for reducing the growing problem of childhood obesity as well as building great lifelong behaviours. Leave the car at home and walk your children to school. Even if you live a longer distance away, why not drive to a point half a mile from the school, and then enjoy the last part of the journey walking together? You will both be benefiting so much! If there are other children in your area why not arrange to all meet up at a fixed time in a certain place then all walk to school together. These so-called ‘Walking Buses’ have proven very popular in some schools and when well supported can have so many positive benefits. Apart from health, there are social, environmental and financial benefits too. Do consider the safety aspects e.g. ask the PTA to fund a set of high visibility vests. In my experience, more accidents occurred among the badly parked cars outside the school gates than ever did on the roads to school. Having covered the old excuses of time and cost, there is of course the greatest British excuse of all, the weather! Stop whingeing! I have seen octogenarian walkers in Florida where heat and humidity do deter any walking at times. Their solution was powerwalking around the air-conditioned shopping malls. Guess what? British shopping centres are warm and dry! If however, you prefer the outdoors than it has been shown that on average (regional variations apply) if you were to walk at the same time every day, you would only get rained on 10 times in any one year. So get out and enjoy the outdoors whenever you can. In fact I am writing this blog on a mild Autumn day surrounded by the beautiful multi-coloured trees in Ashridge Forest after my first walk of this new week. First of all, wear weather-appropriate clothing that is loose and comfortable. Layering can work both ways to help control your temperature. Check out your hat collection too. You need something to keep your head (including ears) warm in winter. A wide brimmed hat will protect against summer sun and keep the rain out of your eyes on the 10 days that you’re going to get wet! Walking boots are not essential but your footwear needs to be supportive, comfortable and well fitting. Trainers will do perfectly. We should not forget safety. Reflective strips, armbands, or a high visibility vest will help keep you safe on dark nights and on winter days. Don’t forget to keep well hydrated. Drink water before and after short walks but for longer excursions a water bottle might be useful to carry with you. Experts recommend that we should try to do some exercise for at least 20 min every day. Our goal for this first week is to walk for 30 min every day in addition to any normal daily activities. Either warm up first by marching on the spot for a few minutes or just walk slowly for the first 5 min. Then increase your pace for 20 min, slowing down to cool off the final 5 min. 30 minutes may sound like a lot, but it’s only 2% of your entire day. Many people spend more than 15% of their day sat in front of the TV. If you can already walk for 30 minutes without any discomfort then aim to do it every day. But if 30 minutes is really too much at the beginning then split it into two 15 min walks. Start thinking how to build walking into your day. For example the journey to school, or to the office or workplace? How about a lunch time walk? Or a walk after-dinner. Another option might be to split your weekly shopping into several smaller journeys. Walk to the shops and back but use a rucksack to carry groceries, not bags in your hands. Your goal for the second week will be to increase your walking time by 10% . Yes, that’s just three more minutes every day. Try to monitor your speed. You should be walking briskly enough to breathe harder and become a little bit warmer. A good test of this speed is that you should be able to hold a conversation while walking along. If you cannot manage to talk properly you may be going too fast but if you’re singing your favourite songs out loud as you walk you’re probably going to slowly. Add power and speed to your walk by using your arms. Bending them at the elbow and swinging them back and forth as you walk will burn more calories. Make small changes at home. Use the stairs whenever you can. Walk around while you are chatting on the phone. How about hiding the TV remote so that you have to get up to change channels. You could also walk around during commercial breaks. When you go out how about offering to take the neighbour’s dog for a walk! Your goal for the third week will be to add another 10% to your time but also try to build more walking into your everyday activities. Park further away from work and walk the last bit. Get up and walk to see colleagues instead of sending texts or e-mails when they are in the same building. Use stairs when you can or walk up escalators but try to avoid using lifts.How about cancelling newspaper or milk deliveries so that you can walk to the shop in the morning to collect them? Your goal in week four will be to add another 10% to your walking time, so you should now be walking for at least 40 min every day. More importantly, in week four, try to add some inclines to your walk. Walking uphill for short distances will add considerably to the effort needed. Not only will you burn more calories but you’ll increase strength and stamina. It has been shown that walking uphill will make your heart work harder and burn at least one third more calories than a level walk. If there are no hills around, then walking on different surfaces is better than nothing because soft surfaces like grass, sand or pebbles take more energy and will help to improve your strength. By adding just 10% to your walking time every week you will be walking for an hour by the time you get to 10 weeks. By this time you will start to lose weight too. Check your posture, making sure that you stand tall with your chin parallel to the ground and your eyes looking ahead with your shoulders relaxed. You also need to get your technique right. Ensure that your heel touches down first and then roll through the step from heel to toe pushing off with your toe. Now you can also start to increase your pace for a few minutes during each walk. The length of your stride should stay the same; just try to take more steps per minute. Now you can think about setting monthly goals. You could increase the length of time or walking speed. How about planning a challenging weekend walk or two? Of course if appropriate get the whole family involved. Also see if there are any charity walks that you could join in with. By now you may have got the exercise bug, so you might start looking at other forms of exercise to add to your regime such as swimming or dancing. As you continue, motivation will become really important. Try not to give up just because you have missed a few days. Vary your routine by walking different routes or walking at different times of the day Find out if there are any organised walks in your area. How about dragging a friend along with you or even form your own group of walking buddies. Of course you can listen to music while you walk too, but take care if there is traffic around! Most of all have fun and let me know how you get on. Guest Post: Do You Suffer From 'Pathological Altruism'? For a while now, I’ve been considering inviting guest bloggers to contribute to this site. Today I read a post written by the wonderful Edna Murdoch, the Director of the Coaching Supervision Academy, which struck a chord with me. Edna has kindly agreed to my reproducing it here, and so I am proud to welcome her as my first guest blogger! More info on the CSA appears at the end of this post. I am intrigued to discover that this autumn, OUP are publishing a scholarly volume of essays on the theme of Pathological Altruism. The NYT says that: ‘The book is the first comprehensive treatment of the idea that when ostensibly generous “how can I help you?” behavior is taken to extremes, misapplied or stridently rhapsodized, it can become unhelpful, unproductive and even destructive. I thought immediately of coaches and of our naturally generous disposition – somewhere in the midst of our businesses, we are ‘helpers’. As such, we need to keep our balance and not lapse into rescuing. ‘Rescuing’ is a term in Transactional Analysis, which indicates that we are over-doing the altruism, going the extra mile to an unhelpful degree. What happens as a result, is that we distort the professional relationship and lose presence, awareness and clarity. If you want to know much more about how this works, see the superb article on the Karpman Drama Triangle by Miriam Orriss on the CSA website (Resources). So we come back to the importance of Coaching Presence – the ability to stay ‘empty’ and present to all that is going on between coach and client – as well as attending to the content of the session. I find in my own coaching and in supervision with coaches, that the difficulty of paying attention to ‘all of it’, without over-trying, is a recurring theme. I also know that when we ‘get it’, that the essential catalyzing/transforming aspect of our work as coaches, is the relationship, we tend to take more care of interpersonal dynamics and especially, of our part in those. Creating spaciousness in relationship, so that all parties can breathe and where the practitioner is not caught in over-helping, is an essential skill. Research in professions akin to coaching indicates that it is not our tool kits, our wonderful range of skills, but our ‘being with’ the client that makes a difference. If you are interested in why this is so at a biological and chemical level, do have a look at a marvellous book called ’A General Theory of Love’ by Lewis, Amini and Lannon. Finally, the Buddhists make a nice distinction between ‘compassion’ and ‘idiot compassion’. An important question might be: How do I know when I am moving form the energy of appropriate compassion to idiot compassion? What in my body/mind system alerts me to knowing that I might be crossing this frontier? What practices support me to stay out of excessive altruism – sometimes disguised and working hard for the client! Interestingly, research shows that empathetic nurses burn out and leave the profession more quickly than do their peers who remain aloof. Let’s protect our energy and our skills and avoid ‘pathological altruism’. A very important point made Edna! I am reminded of some words of wisdom given to me by a good friend many years ago. Brian is an entrepreneur and self-made millionaire who was very altruistic himself but he warned against “being so heavenly minded that you are no earthly good”! The Coaching Supervision Academy (CSA) is a leading UK-based provider of coaching supervision training and practical supervision support. They have a great website for coaches at http://coachingsupervisionacademy.com/ The CSA was formally established in 2001 by Edna Murdoch and Miriam Orriss. Both practicing coaches, they discovered a distinct lack of supervision options, so decided to solve the problem themselves. Having spent a day working with both these ladies, I hold them in very high esteem for their professionalism, friendliness and their passionate support of coaches! HootSuite.com: This is a great tool for managing multiple Twitter accounts as well as Facebook, LinkedIn and others. You can set up personalised columns for these feeds, and you can also compose messages before choosing which social account to post them to. CoTweet: This comes in a standard free version and a paid premium version, and is aimed at the business market. CoTweet manages up to five Twitter accounts, allowing brand and keyword monitoring using Twitter search. There are useful workflow management capabilities for use with a group of co-users. 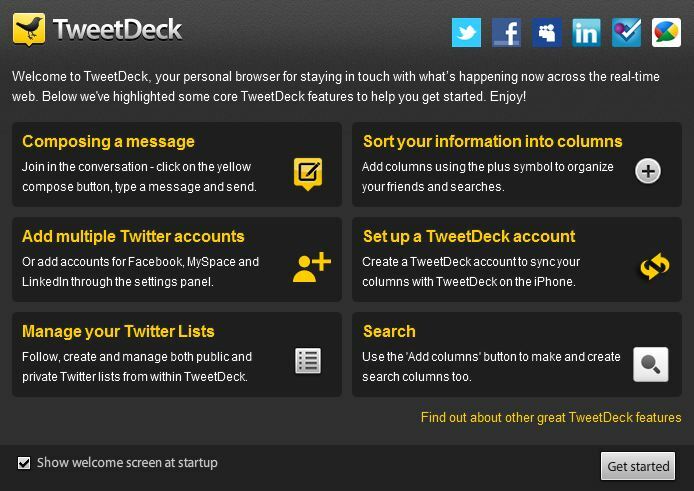 TweetDeck: This is your personal, real-time social media browser. It connects you with all your important contacts across Twitter, Facebook, MySpace, LinkedIn, Foursquare, Google, Buzz and others. It’s also great for managing multiple Twitter accounts. There are many other Twitter management tools such as EasyTweets, Seesmic, splitweet, Tweet-visor, Echophon for Firefox users and Silverbird for Chrome users. There is also MarketMeSuite, which I will return to later as it deserves special mention. The extremely helpful Tweetdeck welcome screen. My ‘dashboard’ of choice is TweetDeck, so that’s the one I’ll look at in more detail. It is also important to note that as of May 2011, TweetDeck has officially become part of Twitter after Twitter recognised its potential by purchasing the company. Iain Dodsworth, a London-based programmer, set his mind to organising everything that was happening on Twitter. the result, in 2008, was TweetDeck, which comes in the form of a ‘dashboard’, allowing users to monitor in real-time what others are saying. Particularly useful for power-users, TweetDeck provides a platform from which to monitor and track all the real-time conversations that matter most to them. This makes true engagement with other Twitter users much easier. The principle feature of TweetDeck is that the user can create groups and so extend the Twitter service. Through these groups, it is possible to check the Tweets of a subset of the user’s followers. These groups appear as columns on the screen, and they can be used to display Friends, News, Mentions, Business tweets or whatever group heading the user chooses to set up. Additionally, TweetDeck now has the ability to synch groups and settings between the Desktop standalone version of the program and the free iPhone app. Thus you can access the same TweetDeck information at home or on the move. I mentioned MarkMeSuite earlier. This is another Social Media marketing dashboard designed with business users in mind. As a great bonus, its premium service is now completely free. This application not only allows for Twitter management, but has a wide range of other tools, allowing such things as brand management and unlimited team members (multiple users). It is well worth a look for serious business users.